January’s book is a new look at our local history right here in Lexington. 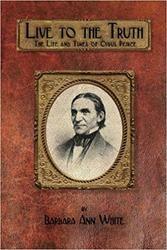 “Live to the Truth: the Life and Times of Cyrus Peirce” follows the story of Cyrus Peirce, who was chosen by Horace Mann to be the first director of the Lexington Normal School in 1839. The school, in the same building as the current Simon W. Robinson Masonic Lodge, was the first teacher training school in the United States. An early advocate for student teaching, conversational learning, and school integration, Peirce was often at odds with the 19th century establishment, but his methods that were formulated here form the basis of much of our modern education today. ​Author Barbara Ann White will lead the discussion. Catered dinner from Neillio's included.